If you use Infusionsoft and feel like your marketing efforts have been blindfolded guesses in the dark, our software is the solution. AnalyticsConnect.io is the secret used by hundreds of Infusionsoft users worldwide to lower advertising costs, increase sales, and boost revenue per sale. Our software reports all of the sales data from your Infusionsoft shopping cart, order forms, and offline sales into Google Analytics Ecommerce, Google AdWords Conversion Tracking, Facebook Ads Conversion Tracking, and Bing Ads Conversion Tracking. Finally your analytics will show you the only thing that matters: Where your most profitable customers are coming from and how to find more of them. Get started now with our Free 15 Day Trial and within minutes your Google Analytics, AdWords, Facebook, and Bing dashboards will start lighting up with answers. See which campaigns and referral sources are most profitable. The Ecommerce section of your Google Analytics account will have all the transaction data needed to enable Google's advanced tools for analyzing online business performance. You'll also see demographics allowing you to profile your most profitable customers. When you understand where your money is coming from it's easy to do more of what's working and less of what isn't. Know with one look which campaigns are profitable and which are not. Because you're now providing AdWords with all the data it needs for return on investment calculations, you can use the AdWords Conversion Optimizer, which bids automatically to provide you with sales, rather than simply clicks. It's always been easy to see how much your campaigns are costing you. Wouldn't it be nice to see exactly what they are earning for you? Running your ads based on conversion data without factoring in the value of the conversion is a recipe for disaster. Not all conversions are equal. A conversion for $500.00 is five hundred times more valuable than a conversion for $1.00. You want to focus your campaigns on the demographics that are spending the most money on your site. Give Facebook the data it needs with our software, and building an audience profile to market to becomes easy. Expand your marketing efforts to an additional 5.2 billion searches per month through Bing Ads, allowing the delivery of your campaigns on Microsoft, Yahoo, and AOL sites. Adding Bing means expanding your target market by almost 50% when compared to using Google AdWords alone. And now you can use our software to feed Bing your transaction data, for optimizing advertising spend vs. revenue, similar to what we enable with Google AdWords. Are your clients shopping and paying online using the Infusionsoft shopping cart or order forms? We've got you covered. Do you use the internet to find leads, but take orders over the phone? Yup, our software will happily track that also. What about subscriptions and recurring payments? Yes and yes... all sales get reported, with accurate original traffic source data. The first version of AnalyticsConnect.io was born in 2011 to provide a solution for getting Infusionsoft sales data into Google Analytics Ecommerce and Google AdWords. Less than a year later it was repackaged into an Infusionsoft Plugin and was one of the first products available on the Infusionsoft Marketplace. Today, our software is used by hundreds of Infusionsoft's most successful marketers. "Great app that gives us complete perspective of our marketing funnels in Analytics. Their support was great when reaching out, too." "After struggling to get Google Analytics to work on my web forms for several frustrating hours, I finally decided to get this app. It was easy to setup and now I can see all of my sales through Google Analytics which is very insightful for seeing my buy behavior before the purchase. If you are using the ecommerce functionality of Infusionsoft and you want more insights on your buyers, this is essential. In addition to getting the app, I also purchased some support so I could get up and running faster. Well worth the investment!" "This software is awesome! We're a certified partner company with Infusionsoft and this is quickly becoming a "must have" for our clients. Setting up Google Analytics and Infusionsoft to play nicely together is a pain... this makes it easy. The integrations with Google Adwords and Facebook makes it a no-brainer. Best money you can spend to squeeze a bit more juice out of your marketing setup and get a much better idea of what's happening with your marketing efforts." "WE LOVE THIS APP! We've had issues tracking our conversions for years and after years of frustration the Analytics Connect plugin has finally solved our problems. We're finally able to track our conversions and get some valuable insight into our customers. Drawk is great and helped us get everything set up and working perfectly. He went above and beyond to make sure everything was working smoothly. Thanks guys!" "We love being able to tie our Infusionsoft data to AdWords so we can track the effectiveness of our ads." "We've been using this much needed and appreciated API for over 6 months now and find it suits all of our needs. 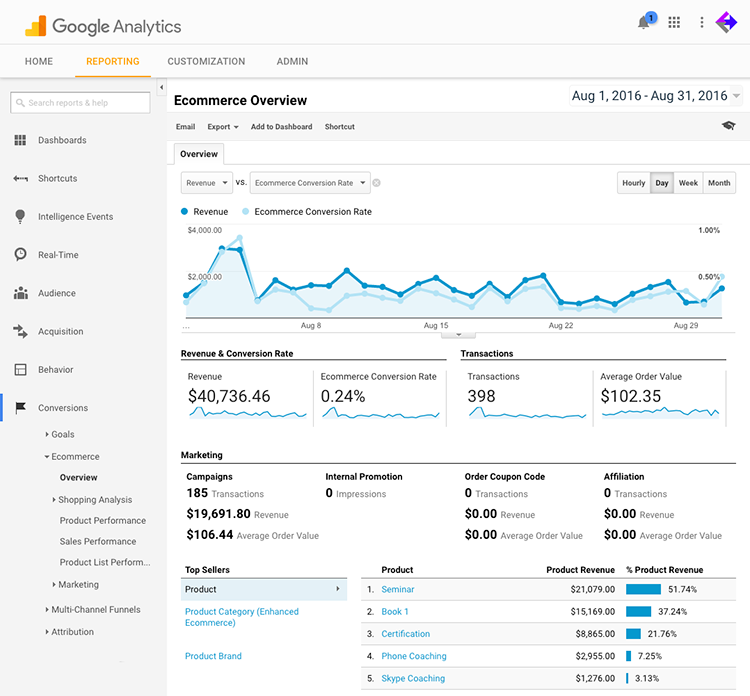 It allows us to track our ecommerce data in Google Analytics. Not very difficult to set up and the customer support is excellent. Multiple domains are supported. Highly recommended." "The Analytics Connect plugin has been a game-changer for us and we now know the exact ROI of each keyword! Drawk was very knowledgeable and accommodating in troubleshooting my installation and provided valuable insight into my online sales process. Great app with great support!" "An A+ product -- essential if you use Infusionsoft and Google Analytics. Drawk from AnalyticsConnect really went out of his way to help us integrate the product with our unconventional checkout process. Now it works perfectly." "Finally I have real live ecommerce tracking with google analytics and my infusionsoft shopping cart! Works as advertised and the customer support was immediate and thorough. If you want to track important conversion data from infusionsoft, this is your app." See where your sales are coming from. See the dollar value each source is generating. See how many days and visits to your site it takes for a purchase to happen. See which versions of your content generate the highest sales. See which keywords are generating high value sales and which are generating only clicks. See what customer types generate the highest value sales. See how the use of promotional codes is impacting your business.